"A hundred houses were open to receive the lady, but a meeting of the Soldiers' Aid Society being hastily convened, it was judged proper to have the funeral obsequies as public as possible, to which end the chapel attached to Hospital No. 4 was beautifully arranged, by order of the surgeon in charge, Dr. Micks, and here it was proposed the corpse should lie in state. "On the arrival of the steamer Cape Fear, which was appointed to convey the remains to town, the ladies lined the wharf, closing round and receiving into their midst the lifeless form of her who had been so zealous, so devoted, and so self-sacrificing an adherent of the cause dearest to all their hearts. She was then carried to the chapel, where a guard of honor was stationed at the door. "It was a solemn and imposing spectacle. The profusion of wax lights round the corpse; the quantity of choice flowers in crosses, garlands and bouquets, scattered over it; the silent mourners, sable-robed, at the head and foot; the tide of visitors, women and children with streaming eyes, and soldiers, with bent heads and hushed stares, standing by, paying the last tribute of respect to the departed heroine. On the bier, draped with a magnificent Confederate flag, lay the body, so unchanged as to look like a calm sleeper, while above rose the tall ebony crucifix, emblem of the faith she embraced in happier hours, and which, we humbly trust, was her consolation in passing through the dark waters of the river of death. "She lay there until 2 o'clock of Sunday afternoon, when the body was removed to the Catholic Church of St. Thomas. Here the funeral oration was delivered by the Rev. Dr. Corcoran, which was a touching tribute to the heroism and patriotic devotion of the deceased, as well as a solemn warning on the uncertainty of all human projects and ambition, even though of the most laudable character. "The coffin, which was as richly decorated as the the resources of the town admitted and still covered with the Confederate flag, was borne to Oakdale Cemetery followed by an immense funeral cortege . A beautiful spot on a grassy slope, overshadowed by wavering trees and in sight of a tranquil lake was chosen for her resting place. Rain fell in torrents during the day, but as the coffin was being lowered into the grave, the sun burst forth in the brightest majesty, and a rainbow of the most vivid colour spanned the horizon. Let us accept the omen not only for her, the quiet sleeper, who after many storms and a tumultuous and checkered life came to peace and rest at last, but also for our beloved country, over which we trust the rainbow of hope will ere long shine with brightest dyes. "The pall-bearers were Colonel Tansill, chief of staff to General Whiting, Major Vanderhorst, J.M. Seixas. Esq., Dr. de Prossett, Dr. Micks and Dr. Medway. "General Whitting and Captain C.B. Poindexter, representing the two services, were prevented from acting as pall-bearers, the former by reason of absence, the latter in consequence of illness. 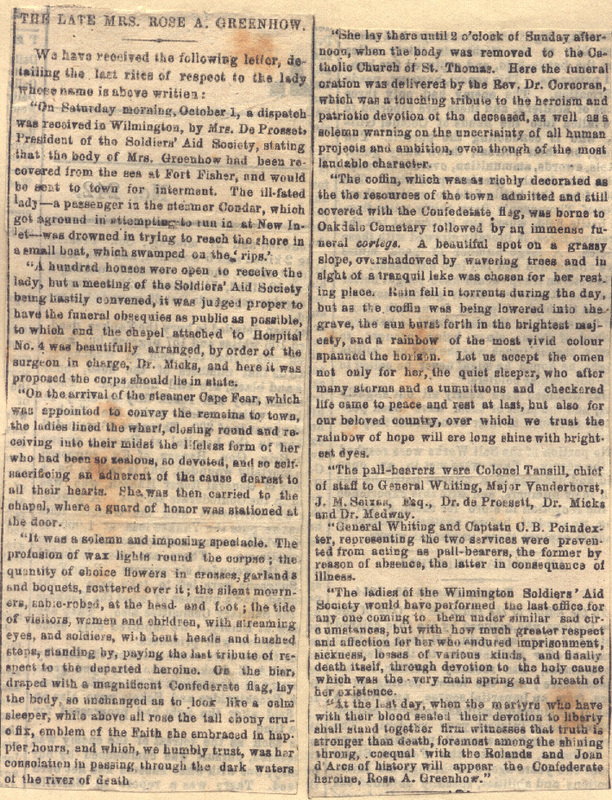 "The ladies of the Wilmington Soldiers' Aid Society would have performed the last office for anyone coming to them under similar sad circumstances, but with how much greater respect and affection for her who endured imprisonment, sickness, losses of various kinds, and finally death itself, through devotion to the holy cause which was the very main spring and breath of her existence. "At the last day, when the martyrs who have with their blood sealed their devotion to liberty shall stand together firm witnesses that truth is stronger than death, foremost among the shinning throng, coequal with the Rolands and Joan d'Arcs of history will appear the Confederate heroine, Rose A. Greenhow." Rose O'Neal Greenhow Papers - Homepage or Index to letters. A project of The Digital Scriptorium, Special Collections Library, Duke University.